PROMOTE makes use of the LEVEL5 system which is specifically designed to assess personal, social and organisational competence developments in rather non- and informal learning settings. 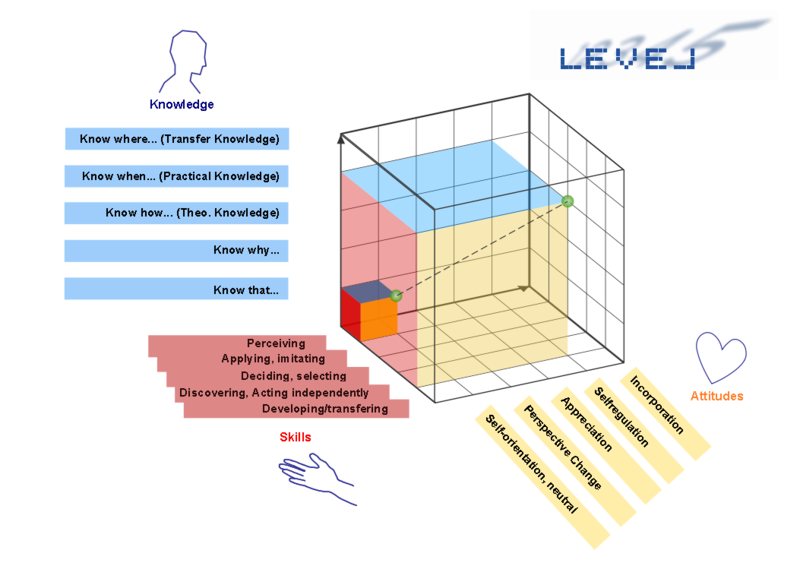 It is based on a 3-dimensio­nal approach to validate cog­nitive, activity related and affective learning outcomes – the LEVEL5 cube. LEVEL5 is a holistic learning process that benefits the learner, learning providers and host entrepreneurs. How and when will LEVEL5 be used? After the preparatory training for young people, and a European training course for host entrepreneurs, the young people will go on a European mobility. They will be hosted by the participating host enterprises. The competences (intercultural, entrepreneurial and mentoring competences) acquired by both groups during the training and the mobility will be validated and documented through the innovative LEVEL5 methodology, developed by the network REVEAL aimed to promote, visualise and validate informal and non-formal learning.